'Tis the season to get scratched arms and hands! I have picked at least 6 of these tubs of blackberries so far ad there are still many more to come! The blackberries were there round the edge when we took over the allotment in 2004 (I think!) and they get a good trim at the end of the season and if they decide to explore the main part of the plot! My wife makes jam, lots of jam! In fact we have all year round jam - well actually jelly - blackberry, blackcurrant, blueberry, raspberry (though not many of these this year), and sometimes damson when we get any. Or combinations of all of these and maybe a bit of apple or rhubarb thrown in too! The blueberries haven't liked the dry, hot weather to be honest, they really need rainwater and eventually I had to resort to using tap water from the one on the plot as the berries were shrivelling up. 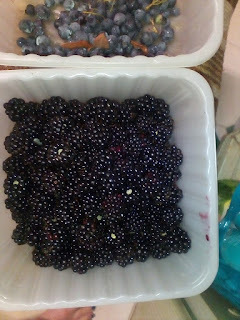 But they recovered ok and have been producing plenty of berries.